A couple of months ago while visiting Imagiknits, I saw several knot bags displayed in the window surrounded by amazing yarn. I really just kind of passed over the bags because they were invisible to me with so much beautiful yarn around, but my friend pointed them out so I took more notice. 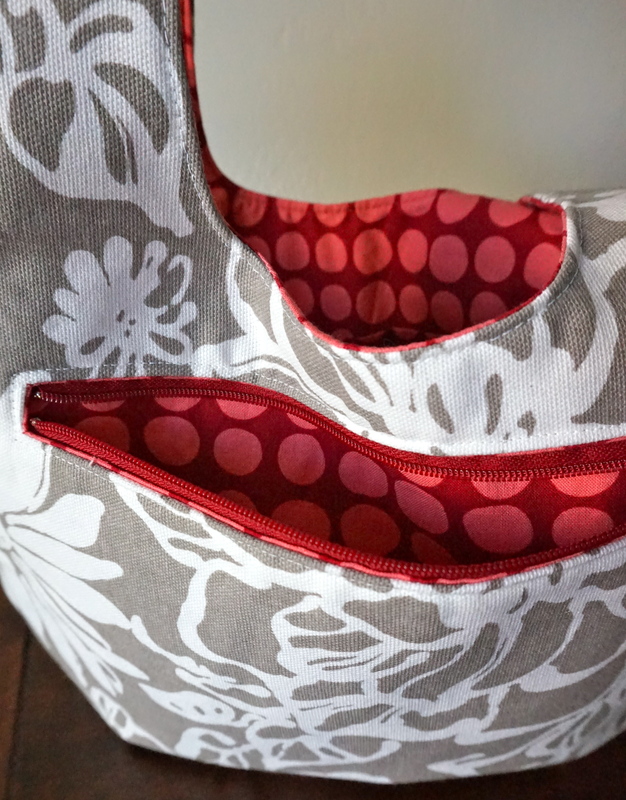 Knot bags are so simple, very quick to sew, and easy to throw a project in and run. 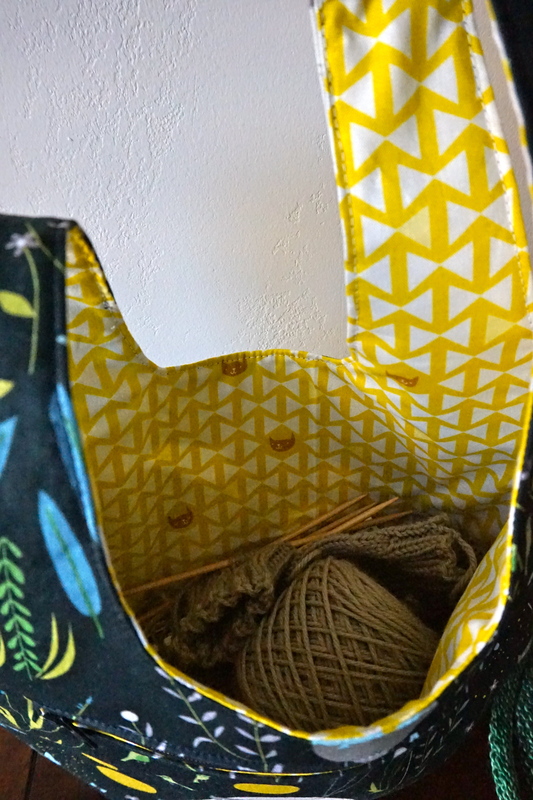 There are several free knot bag patterns available; I chose the grab bag pattern from All People Quilt. I followed all of the instructions provided with the pattern for my first bag, but I really disliked the steps for the straps. I changed the way I did them on the subsequent bags (I’ll explain below). 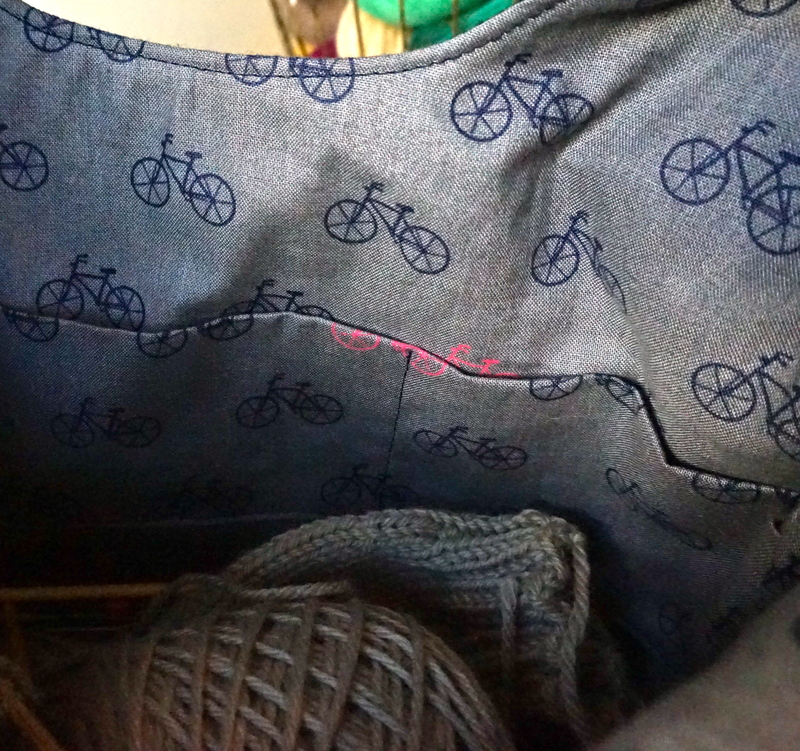 For this first bag (sorry the pictures are so dark), I used a soft wool fabric for the outside, and a cute bicycle print on the inside of which I must’ve tossed the selvage edge… I found both at Stonemountain & Daughter in Berkeley. At first I thought the slouchiness of the fabric was a drawback, but after using it, I like the softness of it, and it can be crammed into small spaces. I added a pocket using the measurements in the pattern. It was very small though. 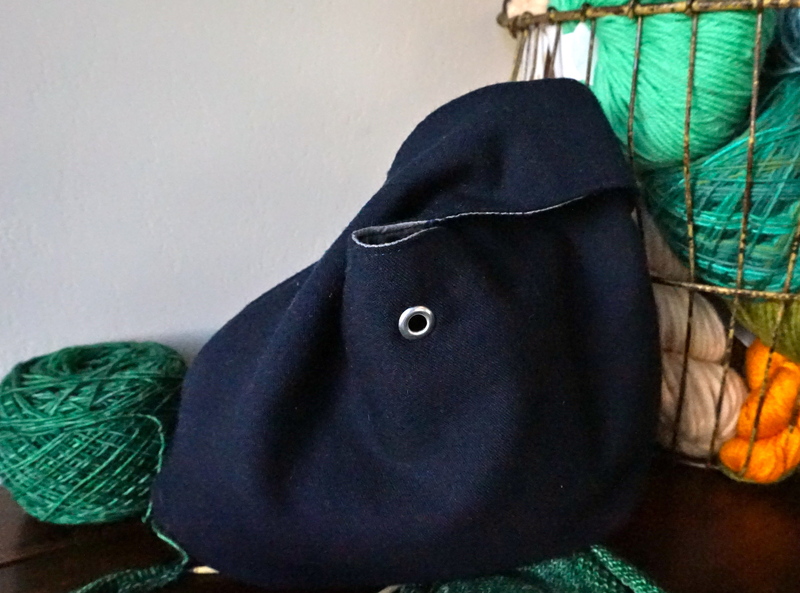 I was playing around with adding pockets, and I added this pleated pocket which is rounded at the bottom. I also used a grommet above it to either use for yarn to go through or earphones (the device then can sit in the pocket). I like it because if I’m sitting on public transit, my earphones won’t get in the way of the knitting project on my lap. 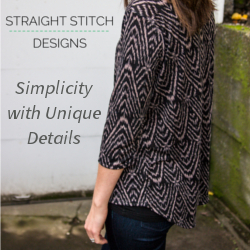 It is very slouchy when closed. I like how soft it is, but the wool fabric does attract every kind of fuzz from the yarn, and pet fur too! 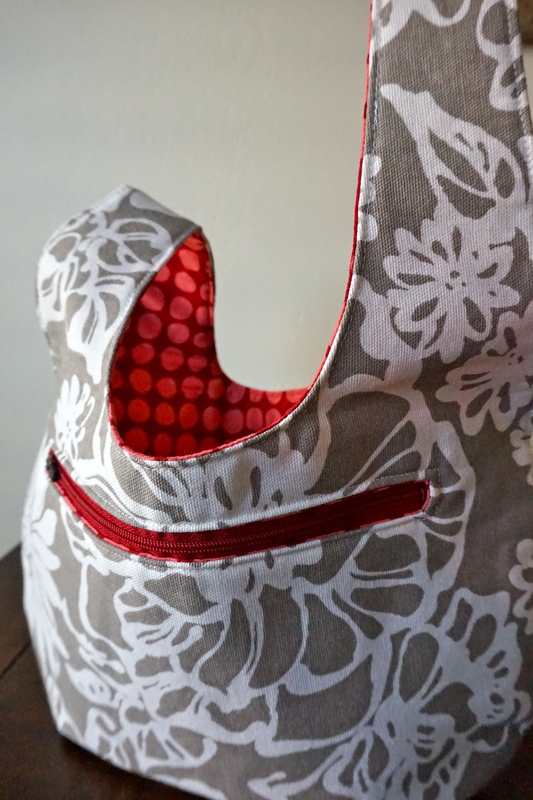 I decided to use a stiffer fabric for the second bag. This is a cotton duck that I had in my stash. I believe it’s from JoAnn’s, and for the lining I used an Amy Butler print from her Love collection. I believe it’s Sun Spots in Wine. I had planned to use this as binding fabric for a quilt, but it just contrasted so nicely with the gray and white fabric I had to use it. 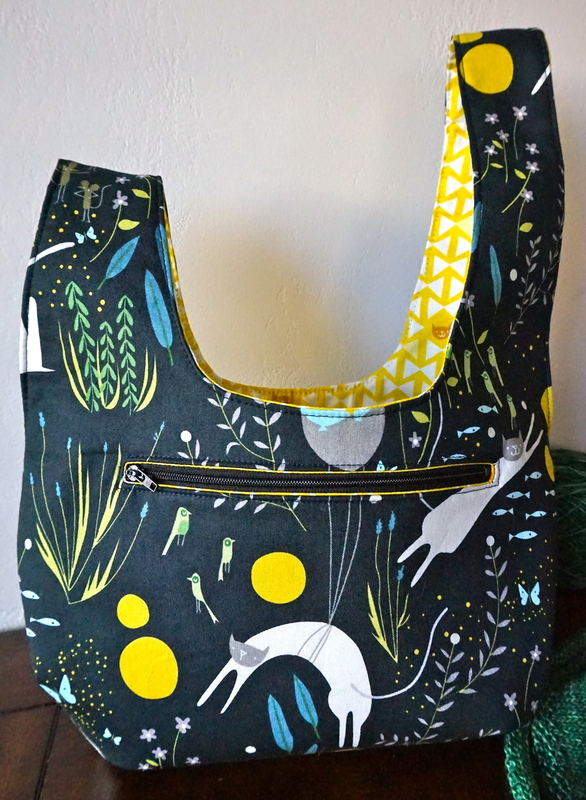 I also decided to add a zipper to the front of this bag because sometimes you just don’t want to have to open the bag to get something (or maybe I’m just that lazy). 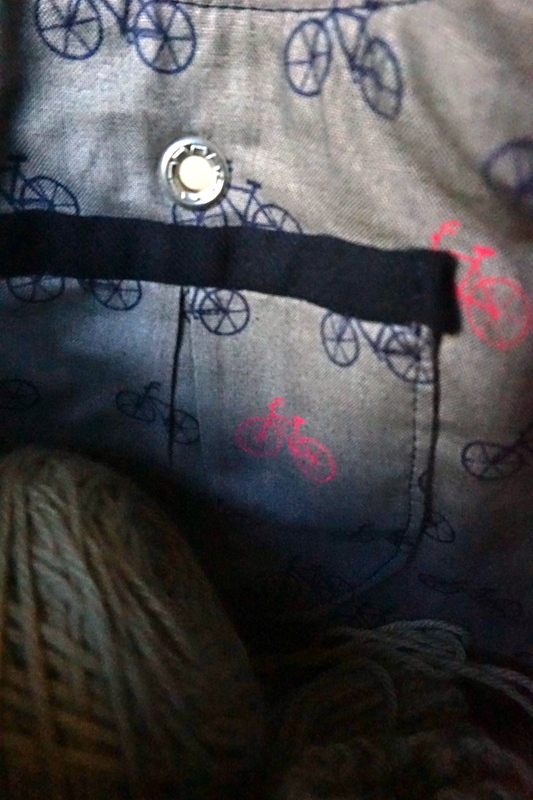 More pockets inside. These I made deeper than the first bag by a couple of inches. 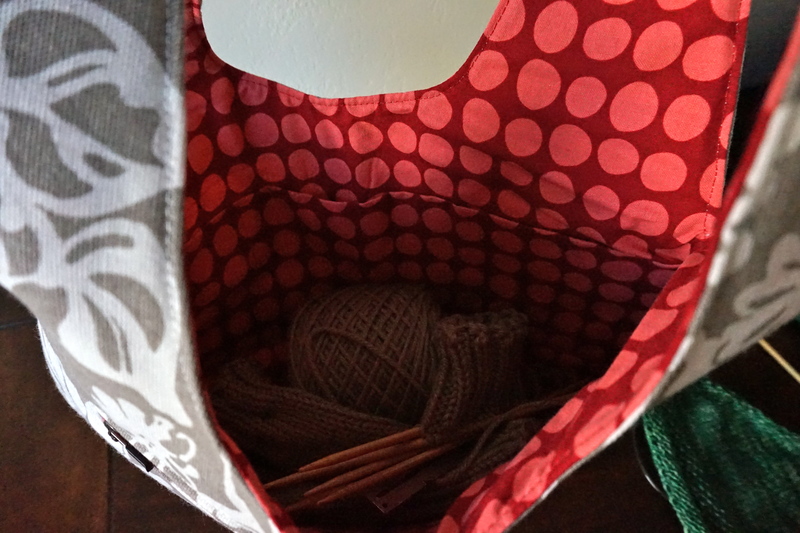 My smaller knitting project fits nicely in the bag. This bag stands up pretty well too! 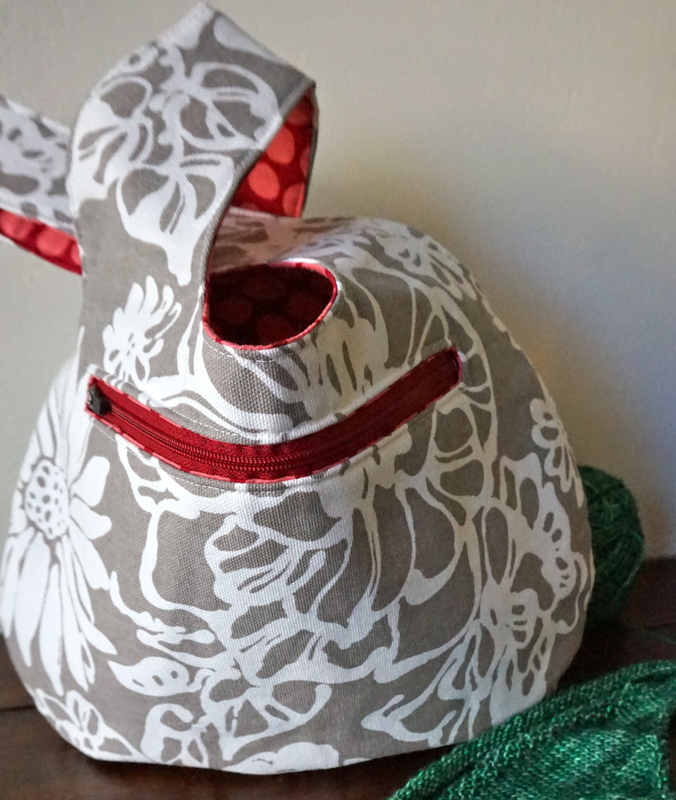 The duck fabric definitely stiffens things up! I don’t know if this is better or not since I haven’t been using it, but I imagine it’s nice as well. At least it will stay open if needed. 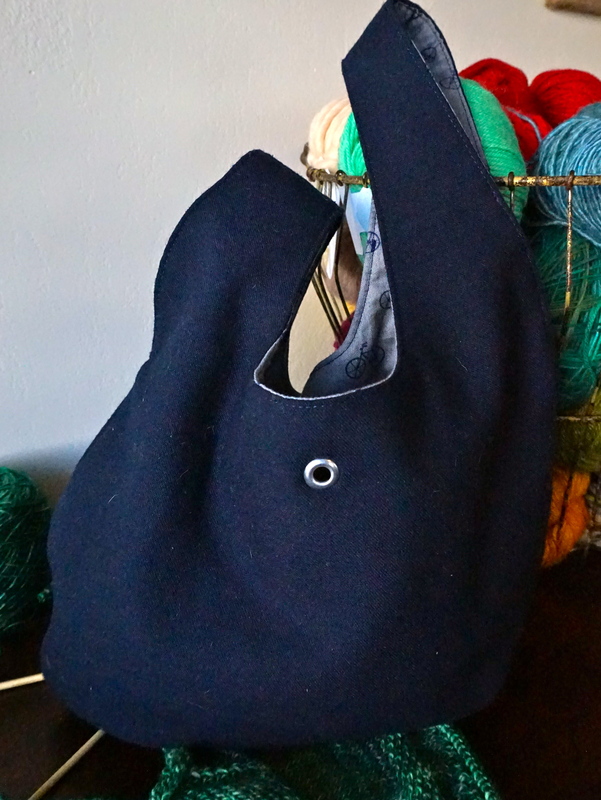 I made this bag for the friend that noticed the bags at Imagiknits. She loves cats and this fabric is super adorable! It’s Cat Nap Cat Dream and Cat Nap Finn, both in green, designed by Lizzy House for Andover Fabrics. Checkout those cat faces!! Both fabrics are quilting cotton weight and stand up pretty well. The only pocket on this bag is the zipper pocket on the front. The lining fabric is directional, but I forgot about this when I made the lining for the zipper pocket, so half of the pocket is upside down. This last bag uses the same cotton duck as the second bag. For the lining I used Flower Bed in yellow from the House & Garden collection by Cloud 9 Fabrics. 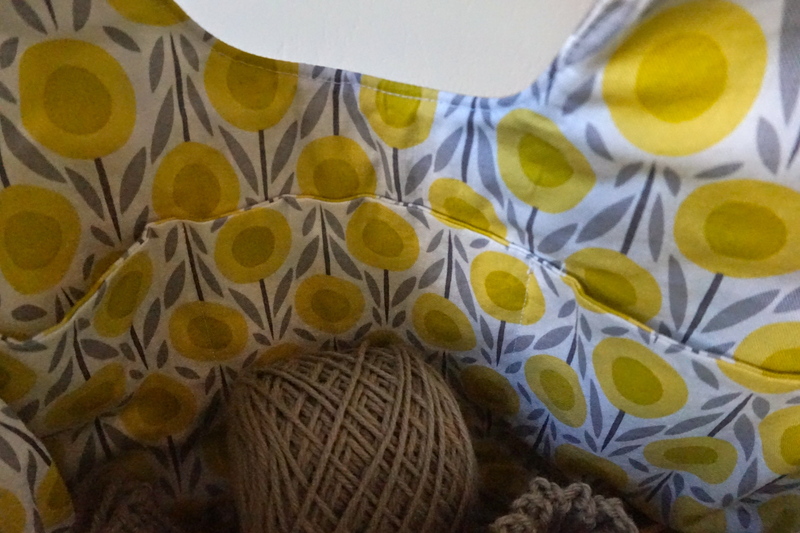 It’s an organic line of fabric that is actually at JoAnn’s, and it was sitting in my stash. 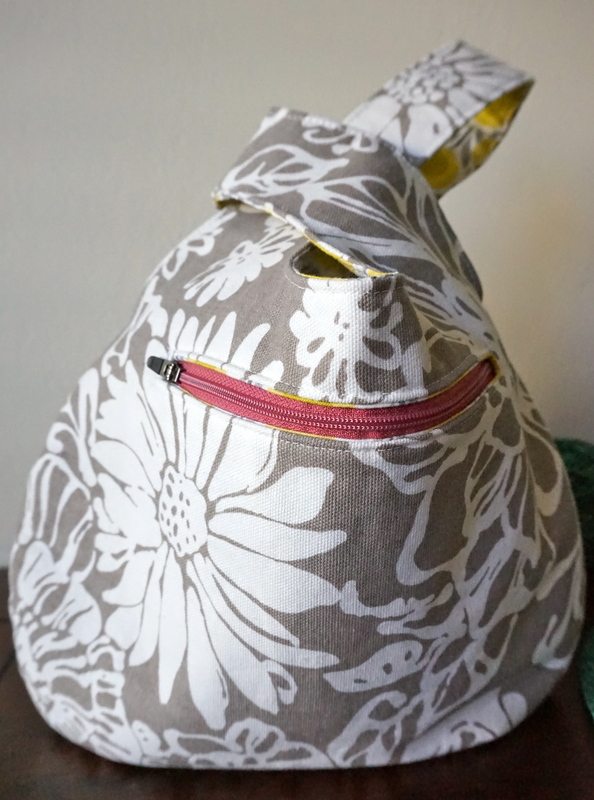 I added the zipper pocket on the front and the big pockets on the inside. Not much more to say after FOUR bags! Honestly it was kind of boring sewing up so many of these, but they’re quick and useful gifts! Instead of leaving the entire tops of the straps unstitched when sewing right sides together, I found it easiest to sew all the way to the top of one side of each strap. On the opposite side of that strap, I would leave a 3″ opening. I did this to each strap, leaving the 3″ opening on the inside of each strap (inside referring to the inside of the bag). 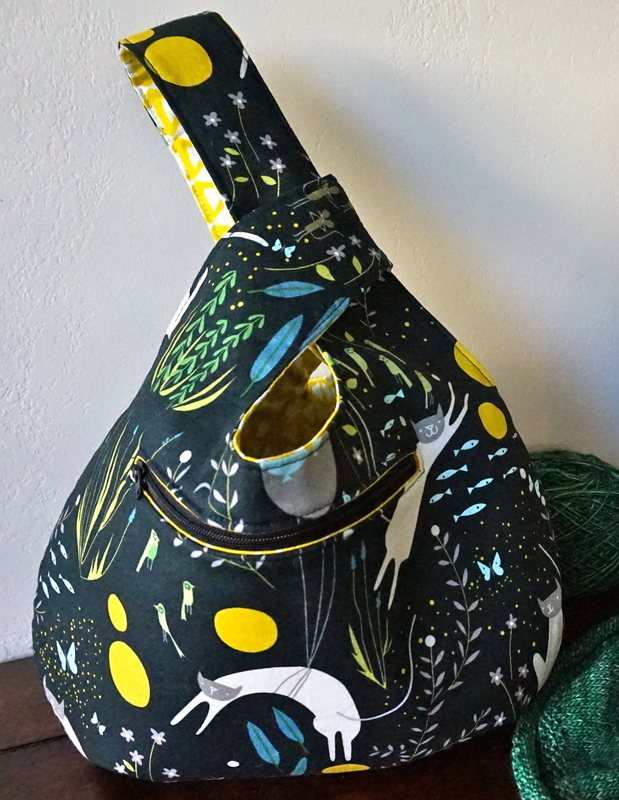 Then when I flipped the bag right side out as in the first picture in the collage, I opened up each strap, placed them right sides together as in the second picture, pinned, and sewed them using a 1/2″ seam allowance. I pressed the seam open and trimmed where it was bulky, then when turned right side out, there is only one seam on each strap to sew shut by tucking in the raw edges and top stitching. Hope that makes sense! 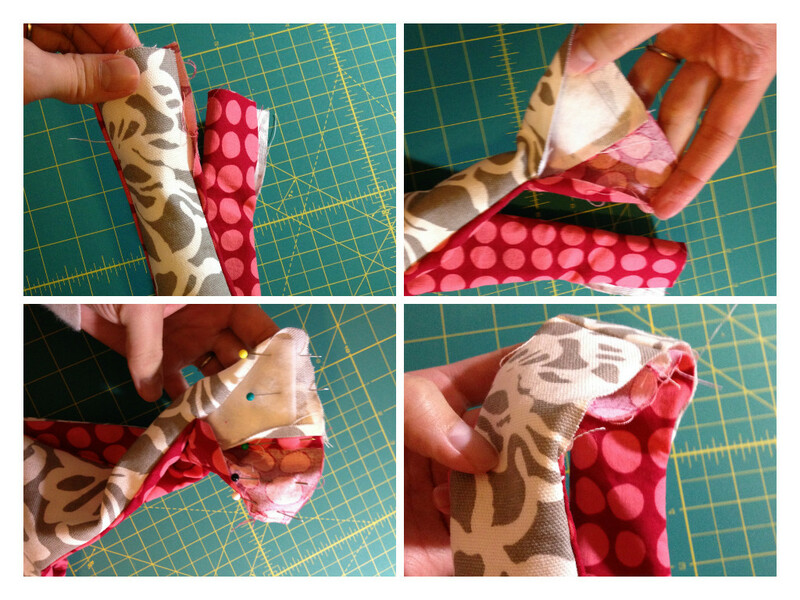 It really simplifies the sewing the straps. My first attempt following the pattern’s instructions left me hand basting to keep the seams laying flat to topstitch. What a pain!